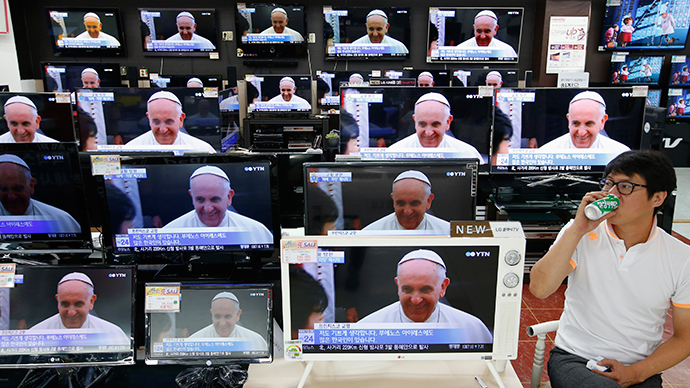 Pope Francis hasn’t watched television since 1990. He made a vow to the Virgin Mary 25 years ago not to do so, the leader of the Catholic church said in an interview this week. The pontiff also revealed he doesn't use the internet, but misses pizza. "I have not watched television since 1990... It's a promise I made to Our Lady of Mount Carmel on the night of July 15, 1990," Pope Francis told a reporter from the Argentinian La Voz Del Pueblo (The Voice of the People) newspaper. Asked whether such a vow was made for any particular reason, the pontiff said that TV just wasn’t his cup of tea. In what was described as a "long and very personal interview" by the Vatican Radio channel, the Pope said speaking to journalists made him uneasy. The Catholic leader said to help him keep up to date with world affairs, he only reads one newspaper, Italian daily La Repubblica, but spends no more than ten minutes leafing through it in the mornings. Reportedly he told a Swiss Guard in the Vatican to update him on the results of Buenos Aires' San Lorenzo football team, which the Pope famously supports. The South American pontiff also told the Argentinian reporter that he never surfs the internet. Instead, before falling asleep Pope Francis reads a book - and then sleeps for six hours. The pontiff also admitted he's aware of being known for "lacking in discipline," and said he finds the protocol "very cold." But it's not TV or football games that the Pope misses from his pre-papacy life. He longs to walk through the streets to a pizzeria for a good pizza, he told the reporter, saying "ordering one in the Vatican is not the same thing."